What a giant in the political world. 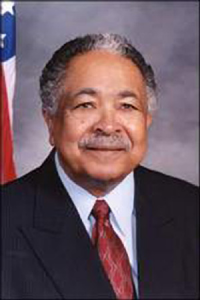 Congressman, lieutenant governor, assemblyman, college professor, teacher and mentor are titles and adjectives that describe Mervyn Malcolm Dymally. I was fortunate to know, work with and serve with Merv Dymally in the State Assembly. He was a friend and supported and advised me throughout my elected political life. From showing me how to hang my suit coat on the lever that holds the tray table closed on an airplane to how to handle the intricate maze of African American politics, which can be filled with political land mines, Mr. Dymally showed me how to survive and succeed in politics. Over curried goat in his favorite Caribbean restaurant to discussions in the Capitol, I along with so many others benefited from his sage advice. When we both worked for Assembly Speaker Robert Hertzberg, I’d drop in on a daily basis just to talk, actually listen. Listen to his stories and insightful observations about Democratic politics and the political landscape. In his last campaign, his headquarters had pictures of Merv on the walls. It was an exhibit of African American political history and Merv was posing with the political paramours of his time. Merv with Robert Kennedy in Watts, Merv with Presidents Johnson and Clinton, Merv with Cesar Chavez, and so many more. When I first ran for school board my political godfather, Mas Fukai, got me a meeting with Congressman Dymally. He endorsed me and opened the doors to the African American political leadership in the district that included Watts. Merv was always willing to endorse me even if it went against the political grain in the African American community. By the way, Congressman Dymally, with the help of his legislative staffer Miya Iwataki, introduced the first redress bill for Japanese Americans in Congress. Neither he nor Miya get the credit they deserve for this act of political courage. “Redress and reparations” was not very popular back then. But I will remember him most affectionately when he and his chief of staff, Ken Orduna, took me to the African American churches during my Assembly campaign. He was like those churches, filled with life, song and the Holy Spirit. Assemblymember Warren T. Furutani represents the 55th Assembly District, which includes the cities of Carson, Harbor City and Harbor Gateway, Lakewood, parts of Long Beach and Wilmington. Meryvn Dymally passed away on Oct. 7 at the age of 86. A public memorial was held Oct. 17.